In ALM Octane, most automated tests run as part of a CI/CD pipeline. UFT tests that were discovered using UFT integration run as part of a test suite. The tests are run by automation tools and the results are sent to ALM Octane. When working with pipelines, CI servers such as Jenkins and TeamCity, run the automated tests. When working with UFT integration, Jenkins manages the UFT machines, similar to Lab Management in ALM. If you set up CI server integration, ALM Octane receives the results of automated tests that run in a pipeline on your CI server. ALM Octane then creates or updates the relevant automated tests and test runs based on those results. For details, see Set up CI servers and Creating automated test entities. You can trigger pipeline runs from ALM Octane, but not individual test runs. Note: If you do not run your automated tests on a supported CI server, you can still send automated test run results to ALM Octane. For details, see Send automated test run results to ALM Octane. Prerequisite: Set up a pipeline and run it, so ALM Octane discovers your automated tests. This includes setting up integration with your CI server, creating a pipeline in ALM Octane, and running it for the first time. For details, see Add automated tests from runs in a pipeline . Running automated tests again: To run your automated tests again, and have the updated results sent to ALM Octane, you must run the whole pipeline. For details, see Run pipelines. This runs all automated tests included in steps of the pipeline. View run results. Open individual automated tests in the Backlog or Quality module to view their results, or open the Pipelines module to view details about all the tests in the pipeline. If you set up UFT integration, ALM Octane continuously reflects any UFT tests and data tables that it discovers in your repository. This lets you plan and trigger UFT test runs from ALM Octane by including the tests in test suites. For details, see Set up UFT integration. Prerequisite: Set up UFT integration so ALM Octane continuously discovers your UFT tests and data tables. 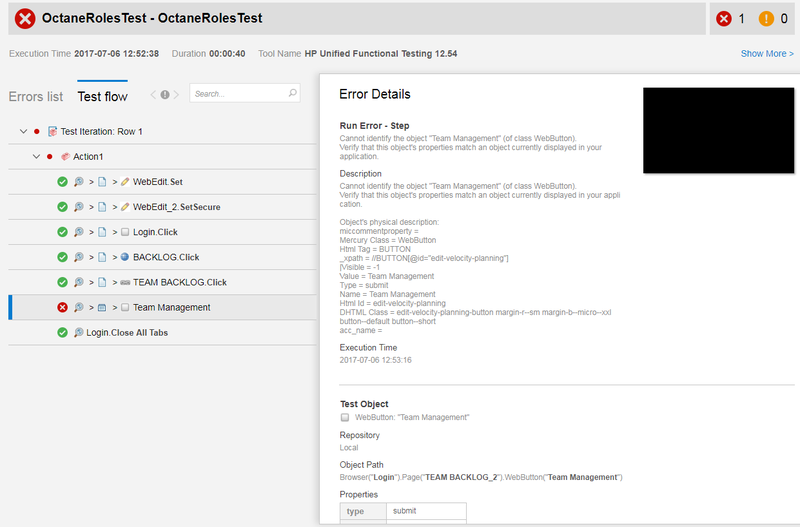 ALM Octane creates executable automated tests to represent the GUI and API UFT tests. You can run these tests from ALM Octane by including them in a test suite. Only UFT tests discovered this way are executable. For details, see Add UFT tests from an SCM repository. Add executable UFT tests to a test suite. In ALM Octane, open the Quality module or a Backlog module. In the Tests tab, add one or more executable automated tests to a test suite. For each test, you can specify a data table to use for parameterizing the test run. For details, see Create test suites. You can also create a mixed suite that contains manual and automated tests. Plan and run the test suite. For details, see Plan and run test suites. The run results are explained in detail in the report provided by UFT. For example, you can find the name of the test, the UFT machine that ran it, the duration of the run, the data table and parameters that it used, details about the success or failure of each step. In ALM, in a test suite, open the Suite runs tab. Click the ID of a suite run to open it. In the suite run, open the Runs tab to view all of the test runs. While the test is running, the run status is In progress. After the run finishes, the results are available in the UFT report and the status shows Passed or Failed. If the test runs finished and the status still shows In progress, try refreshing the list of runs. Click the ID of a test run to open it for more detailed results. Check the UFT report for details about why the test failed. Make sure you set up UFT integration correctly. For details, see Set up UFT integration. Make sure that the UFT machine is not logged off or locked. Tip: If you install UFT version 14.01, you can run UFT tests when the computer is locked, as long as you configured the disconnected remote connection option. For more details on automated test run failures, see Examine failures from test runs.